With the Adult Pair of Sneakers Costume, you'll be a real pair! Pair up with a best friend, twin or your partner. You'll have the cutest couples costume at the party! Transform into a converse sneaker while wearing converse on your feet. When wearing these sneakers, you'll be able to run away from all those scary monsters on Halloween night. This couples costume set comes with two sneaker suits in one bag for a special two in one offer. The sneaker Halloween costumes feature a converse design in the front and a sole print on the back for an authentic sneaker look. You can't wear one shoe without the other, so why show up to the party without your other? 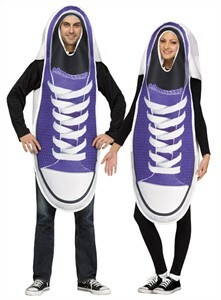 Availability: The Converse Sneakers Couples Costume ships in approximately 1 business day.